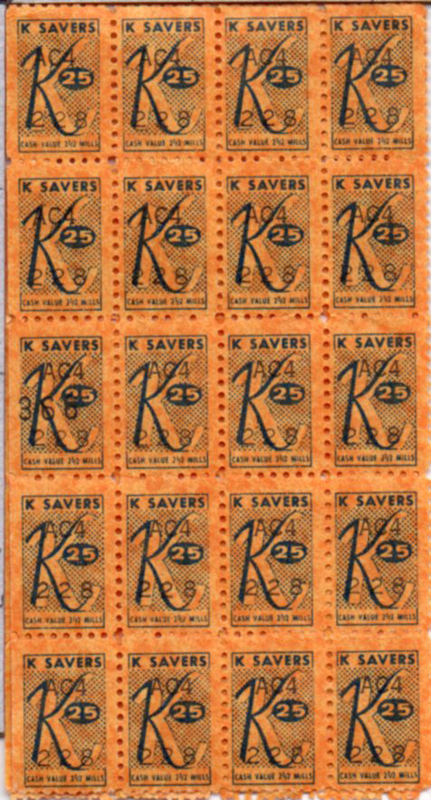 If you wish to brush up on your history of S&H Green Stamps, head over here, Otherwise, read on about K-Savers trading stamps. 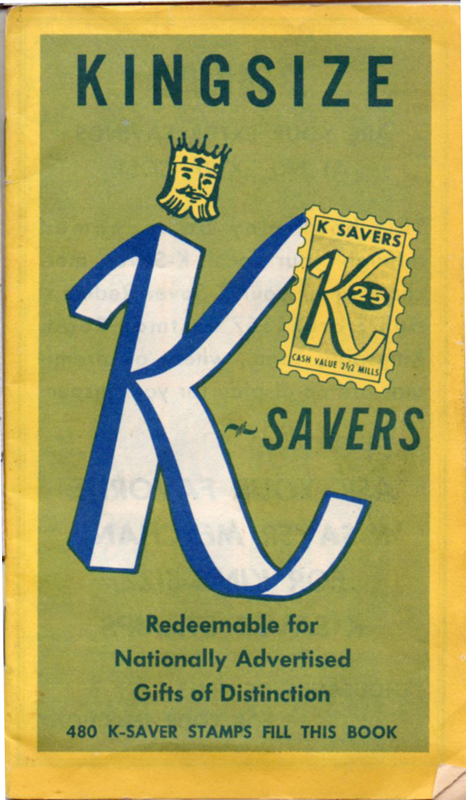 This is the book you’d stick your K-Savers stamps in, all notated (as far as I know) as worth 25 units of something. The book is 3-3/4″ by 5-7/8″. The stamps, shown below, each measure 1/2″ x 1-7/8″. In the 1950s, Oakwood Markets, dating from the late 40s, was seeing a bubbling up of Green Stamp Fever, fed by market competitor Giant Supermarkets. 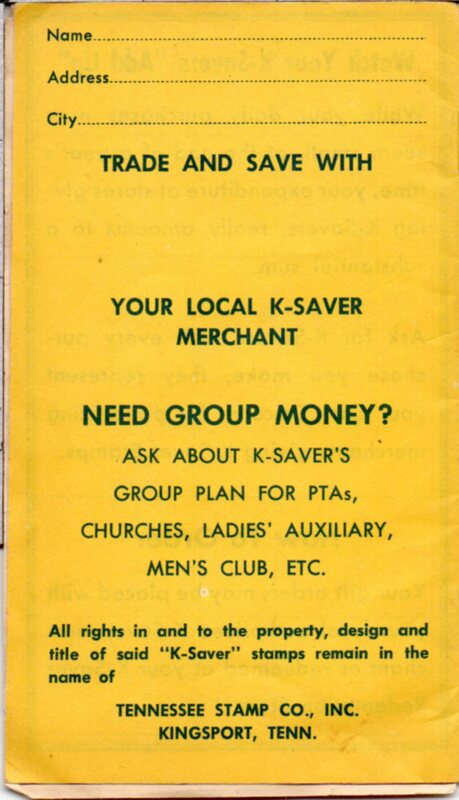 Figuring to find a parade and get in front of it (a favorite suggestion of Don Raines, my former boss), Wallace Boyd, one of the founders of Oakwood Markets, started Tennessee Stamp Company and began to spread K-Saver stamps across their multiple locations (11 or so in the 70s). 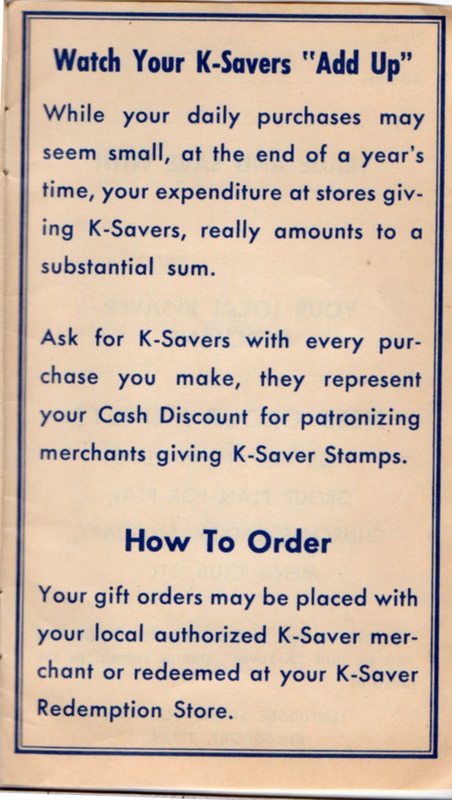 K-Savers had a catalog and a brick-and-mortar store at 813 Eastman Road – the site, next to Sloopy’s, is now home to a gas station. Inside front cover, showing part of a stamp page, and inside of the back cover. 1157 Eastman Road was the location of the Oakwood Market in Greenacres Shopping Center. And note there are none of the legal conditions (you don’t own the stamps!) that S&H put on the back cover of their redememption booklets. 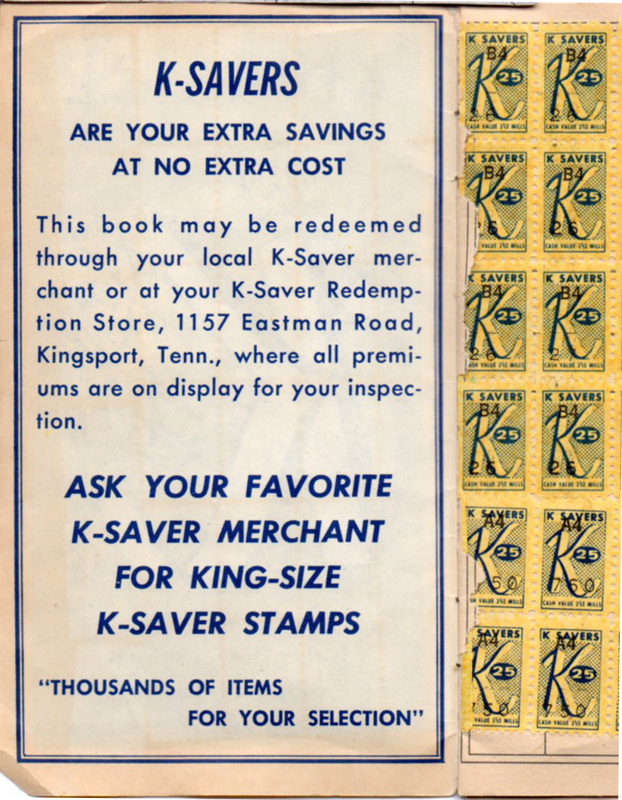 This entry was posted in Kingsport TN ephemera and tagged Don Raines, Giant Supermarkets, Green Stamps, Greenacres Shopping Center, Inc., K-Saver Stamps, Kingsport TN, Oakwood Markets, S&H GreenStamps, Sloopy's Kingsport TN, Tennessee Stamp Co., Wallace Boyd on November 24, 2017 by Bob Lawrence.